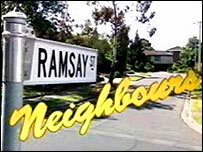 Long-running Australian soap opera Neighbours will move to Five after the BBC pulled out of bidding for the show. The channel will begin showing the soap, which launched the careers of Kylie Minogue and Guy Pearce, in 2008. "Neighbours will be a greatly prized part of our schedule and suitably cherished by us," said Lisa Opie, Five's managing editor of content. The BBC withdrew from talks to keep the show, saying it had been asked to pay three times the show's current price. BBC One controller Peter Fincham said he had been asked for £300m over eight years by Fremantle Media, which owns the rights to the show. "We would have loved to have kept it, but not at any price," he said. "Sad though this is, we think this we're doing the right thing with our licence-payers' money." The show has aired twice a day since 1986, with a combined current audience of about five million. It will end on BBC One next spring. Mr Fincham said it was too early to discuss what would replace the soap on the BBC. "It's a big thing," said Stephen Murphy, editor of Inside Soap magazine. "Families plan their evening meal around the show." "But one of the big criticisms of Neighbours' fans is that the BBC never promoted the show," said Murphy. "Five might make a bit more of a fanfare about it, so it might even be for the benefit of the show in the end." Both Fremantle and Five are owned by the RTL Group media company. Five poached rival Australian soap Home and Away from ITV in 2000. It is widely expected that it will show both series together as part of an "Aussie hour". The BBC should not be entering into 'bidding wars' with license payers money . Set in the fictional suburb of Erinsborough, Neighbours focuses on the residents of Ramsay Street - who over the years have included pop singer Natalie Imbruglia and Gladiator star Russell Crowe. The drama reached its peak in 1990, when it drew a combined audience of 19 million every day. In recent years, viewing figures have fallen with landmark episodes like last year's plane crash only attracting six million. But it is regularly the most-watched daytime television programme in the UK other than the news. In Australia, however, the show has struggled for some years, and currently averages less than 700,000 viewers for TV network Ten. Home and Away, which airs on the rival Seven Network, regularly attracts more than a million people. In March, Ten's drama executive Dan Bennett told Australia's Sunday Telegraph the programme was not performing as well as the network would like. "The figures we're getting now aren't a great basis for our night-time schedule", he said. "We'll be saying goodbye to quite a few characters." But executive producer Ric Pellizzeri played down talk of a crisis.